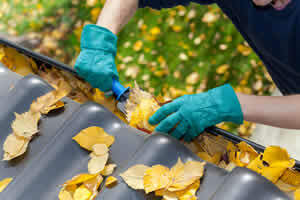 In the fall, clogged gutters are a problem that practically grows overnight. Leaves and other debris end up blown into gutters. You need to check them regularly. Likewise, check that the runoff is falling away from your home, not towards it. In some cases, you may want to look into a contractor installing a downspout extender. You may be asking why hire a contractor to clean your gutter. Safety is the first answer. When it comes to gutter cleaning, depending on the height of your house, maneuvering on a ladder can be dangerous activity. Someone who specializes in working with gutters will have a stable ladder and the right equipment to dig the gunk you of the gutter. You don’t have to pay for any of the equipment or put yourself at risk if you’re not used to climbing ladders. A gutter cover isn’t going to save you from all forms of cleaning, but it will allow you to clean them less. You can have a mesh screen or clip-on grate installed on your gutter. Prevention can lead to your gutters lasting longer. Likewise, you won’t have to have them cleaned as often. When it comes to gutter cleaning, you want to get it right the first time. The less buildup you have in your gutters, the better. With inspection, preventative maintenance and help from a gutter specialist, you don’t have to worry about an overflow of water.